In this example it shows cross-correlation between symbols from user-defined list. This is just one of many things that you can do using Exploration. 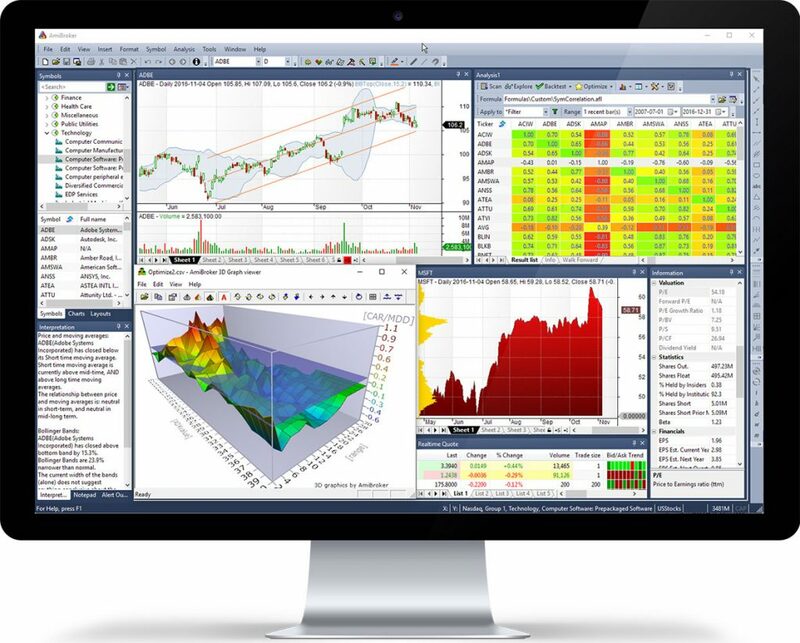 The Analysis window is home to backtesting, optimization, walk-forward testing and Monte Carlo simulation. The interpretation is automatically generated market commentary based on user-definable formulas. You can use pre-written interpretations or create your own. It helps finding out parameter combinations that produce best and most reliable results. 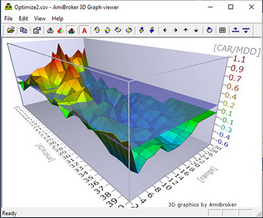 3D chart can be rotated, animated and watched from any angle. A water level can be adjusted to precisely determine peak and valleys above and under certain level. 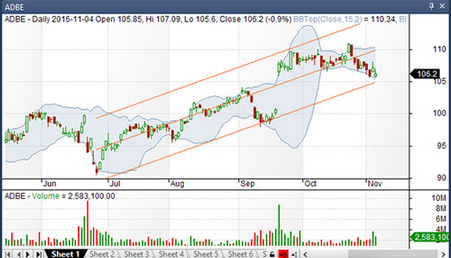 Any chart, not only price, can be displayed as gradient chart for attractive look. On the left side you can see volume-at-price chart (orange) which allows to quickly recognize price levels with highest traded volume. 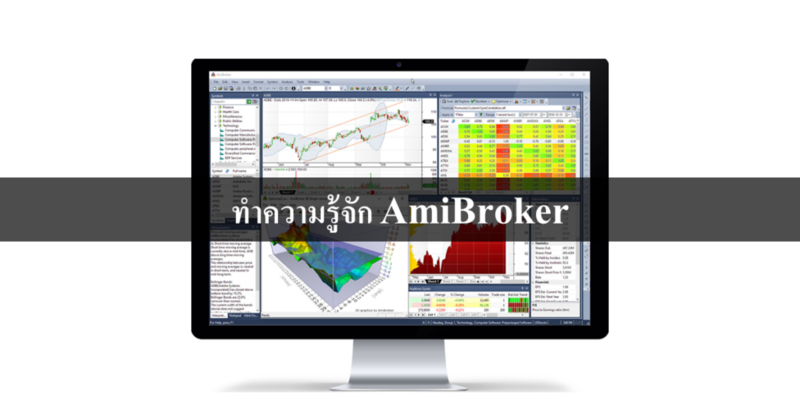 AmiBroker provides instant access to fundamental & valuations data. Fundamental data can also be used in your formulas. The Analysis window is home to all your scans, explorations, portfolio backtests, optimizations, walk-forward tests and Monte Carlo simulation. Exploration is multi-purpose screening/data mining tool that produces fully programmable tabular output with unlimited number of rows and columns from all symbols data. The Backtest allows to test your system performance on historical data. 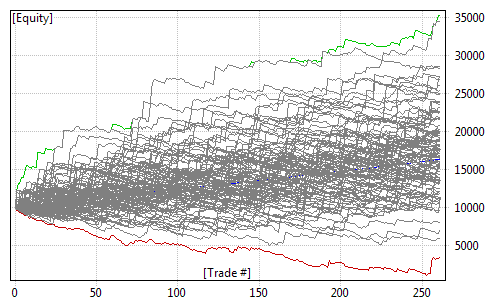 The simulation is performed on portfolio-level as in real-life, with multiple securities traded at the same time, each having user-definable position sizing rule. If multiple entry signals occur on the same bar and you run out of buying power, AmiBroker performs bar-by-bar ranking based on user-definable position score to find preferable trade. 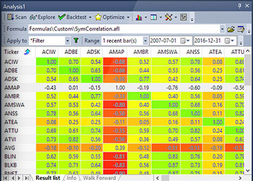 Tell AmiBroker to try thousands of different parameter combinations to find best-performing ones. Use Smart Artificial Intelligence Optimization (Particle Swarm and CMA-ES) to search huge spaces in limited time. Don’t fall into over-fitting trap. Validate robustness of your system by checking its Out-of-Sample performance after In-Sample optimization process.. In AmiBroker Formula Language (AFL) vectors and matrices are native types like plain numbers. To calculate mid point of High and Low arrays element-by-element you just type MidPt = ( H + L )/2; // H and L are arrays and it gets compiled to vectorized machine code. No need to write loops. This makes it possible to run your formulas at the same speed as code written in assembler. Native fast matrix operators and functions make statistical calculations a breeze. Coding your formula has never been easier with ready-to-use Code snippets. Use dozens of pre-written snippets that implement common coding tasks and patterns, or create your own snippets! The debugger allows you to single-step thru your code and watch the variables in run-time to better understand what your formula is doing. 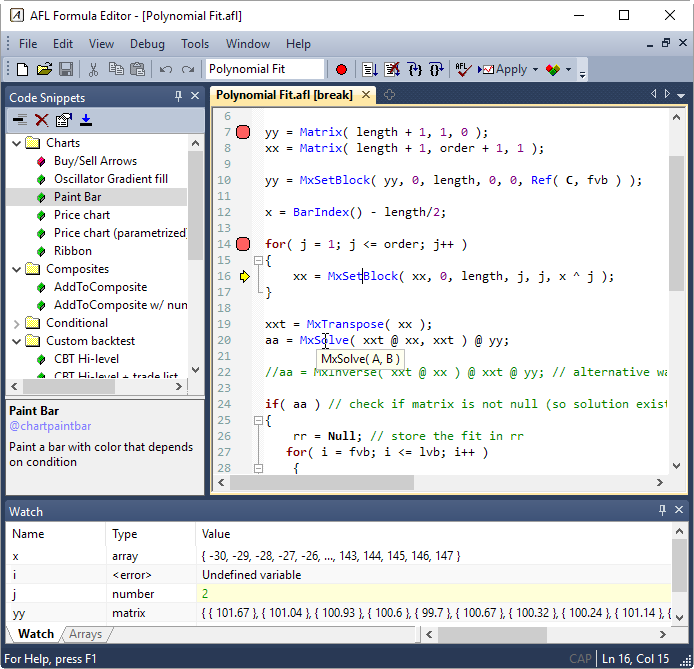 Enjoy advanced editor with syntax highlighting, auto-complete, parameter call tips, code folding, auto-indenting and in-line error reporting. When you encounter an error, meaningful message is displayed right in-line so you don’t strain your eyes. All your formulas automatically benefit from multiple processors/cores. 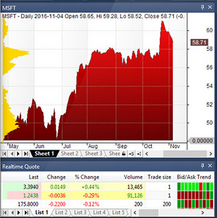 Each chart formula, graphic renderer and every analysis window runs in separate threads.